Takes 25 Minutes , serves 2. Bring 8 cups of water to a boil in a large pot. Add salt and pasta and cook until al dente. Reserve ½ a cup of the pasta water before draining. Drizzle with extra virgin olive oil, toss, cover and set aside until use. In a large skillet on medium-high heat, bring oil to temperature. When the oil is shimmering, add chili flakes and garlic. Move and flip the garlic in the pan until it turns golden brown. Carefully remove garlic from the skillet, roughly chop and reserve. Add the asparagus to the pan and cook for 1 minute. Add the peas and cook for an additional minute. Add the pea shoots and season with salt and pepper. Add the cooked pasta and stir or toss to combine. Add the reserved pasta water, followed by the cheese, and toss until all is combined and the cheese has melted. Transfer to soup plates and garnish with black pepper and additional grated cheese. Serve immediately. 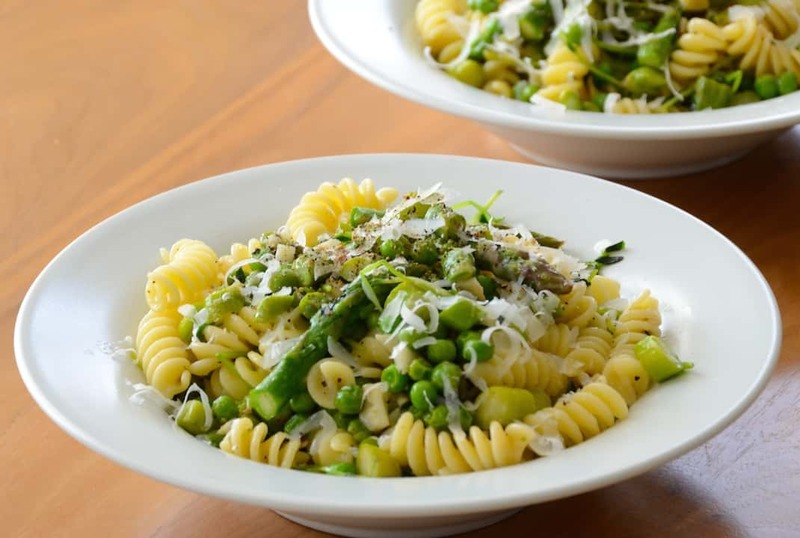 Have a chunk of Parmigiano-Reggiano handy for when you serve this PASTA PRIMAVERA WITH PEAS AND ASPARAGUS, our new seasonal favourite go-to recipe. We’ve all been faced with the same dilemma – we need something for dinner but don’t have much time to make it. This recipe evolved out of necessity, but the result is something you can feel as confident serving for a fancy dinner party as you do a quick weekday meal. 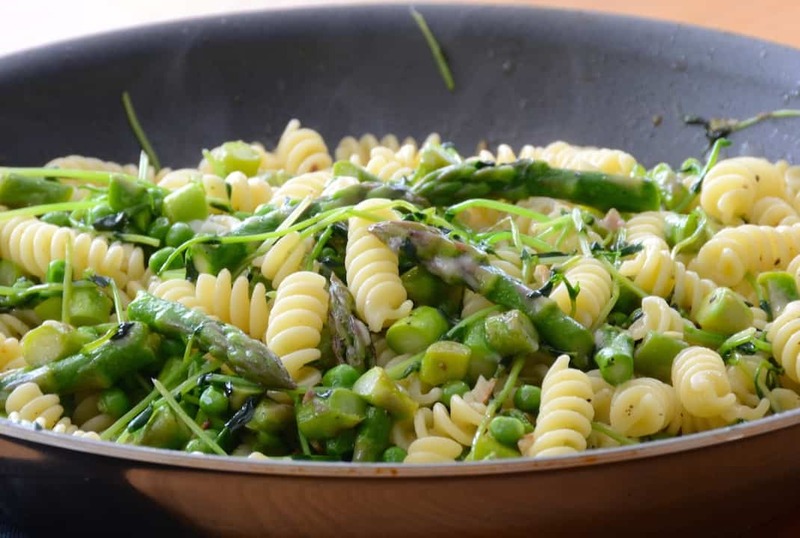 PASTA PRIMAVERA WITH PEAS AND ASPARAGUS is loaded with good taste. The concept started like so many, with Carol and I discussing upcoming content. 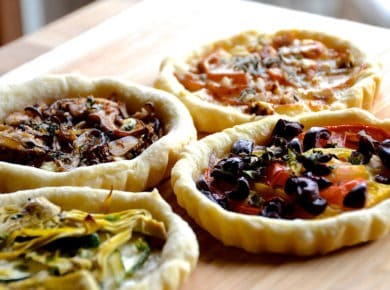 We always try to incorporate ideas and ingredients that we think you’ll appreciate. 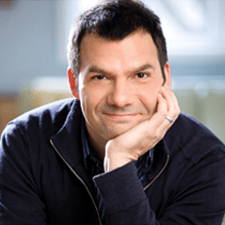 All of you “pressed for time” readers know that pasta recipes can be fast while all of you “healthy and fresh” folks like adding seasonal finds. 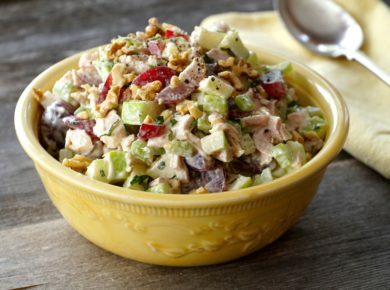 This recipe offers the best of both worlds. If you’re new to Weekend at the Cottage, a few suggestions before I continue: many of our visitors begin by clicking on the process photos and watching our video tutorials. Additionally, we’re finding more and more people bookmarking our pages and also PINNING our recipes to their Pinterest boards. Do any and all of these things, because this recipe is definitely a keeper! Enough said. 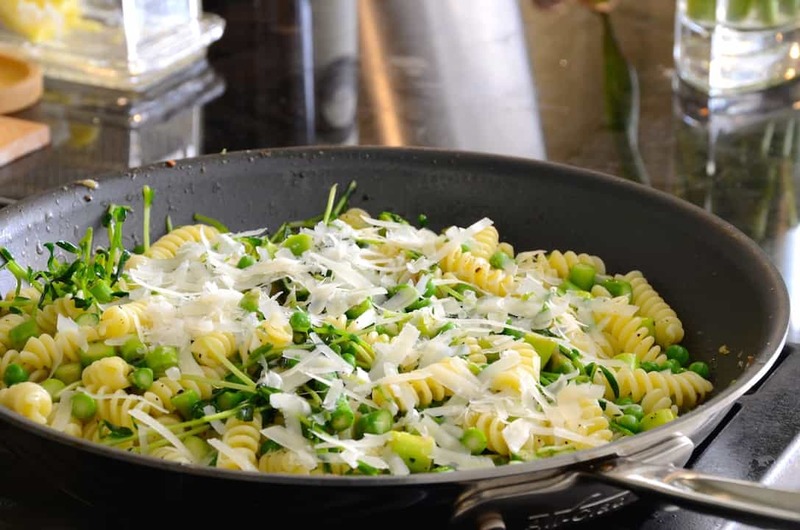 Now, who’s ready for some PASTA PRIMAVERA WITH PEAS AND ASPARAGUS? PASTA – We prepared this delish dish using standard pasta, but the recipe will yield the same superior results if you decide to go with a gluten-free option. We liked fusilli because the corkscrew shape allows the veggies, cheese and subtle sauce to cling to the pasta. Make sure to cook it al dente, and don’t forget to reserve ½ a cup of the pasta water to be used later in the sauce; that salty, slightly starchy liquid helps create a silky consistency. EXTRA VIRGIN OLIVE OIL – We purposely selected a premium EVOO because it offers a more pure, fresh flavour. Although premium EVOO is slightly more expensive than others and has a shorter shelf life, we find it really works well in pasta recipes. Here’s a LINK to the oil we used in this recipe. GARLIC AND CHILI FLAKES – These two readily available ingredients, and how we use them, are key to the success of the recipe, boosting its flavour profile. After peeling the garlic, smash (don’t pulverize) the cloves on your cutting board and then move them about in the pan with the chili flakes to flavour the oil. 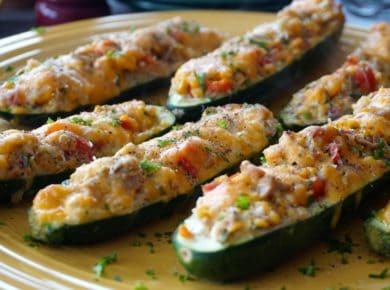 When they’re browned and toasty, roughly chop them and set aside – they’ll make a second appearance at the end of the recipe. 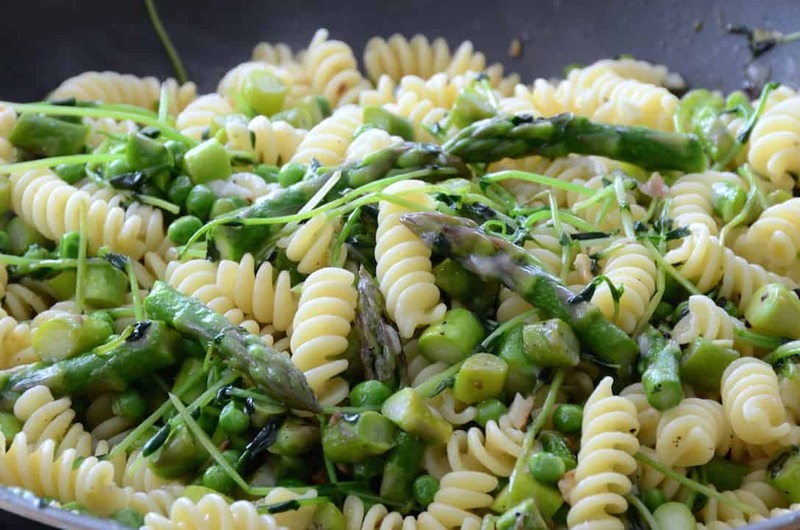 PEAS AND ASPARAGUS – We’re deep in details of this recipe, but it’s important to clarify that it’s really all about these two essential ingredients. Plan accordingly and choose fresh, locally grown ones, though you can substitute frozen peas if fresh are not available. Don’t overcook them; toss them around in the skillet for no more than one or two minutes. This should maintain that fresh taste with every forkful. PEA SHOOTS – This additional fresh vegetable compliment was a last minute addition that happened solely because my local grocery store had just received a shipment. I’m keeping my fingers crossed that you’ll have the same good fortune in finding them because they give the pasta a pop of fresh, almost grassy notes. True spring flavour, for sure! PARMIGIANO-REGGIANO CHEESE – I wanted to add a hard, slightly crumbly cheese to this pasta and Parmigiano-Reggiano delivers in spades. I’ve listed an Amazon link to purchase a microplane ideal for grating cheese into larger shavings. 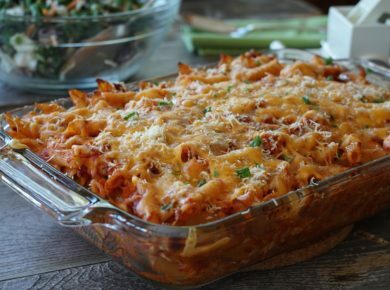 This delivers perfectly sized bites of cheese in the pasta, plus it looks super attractive as a garnish. 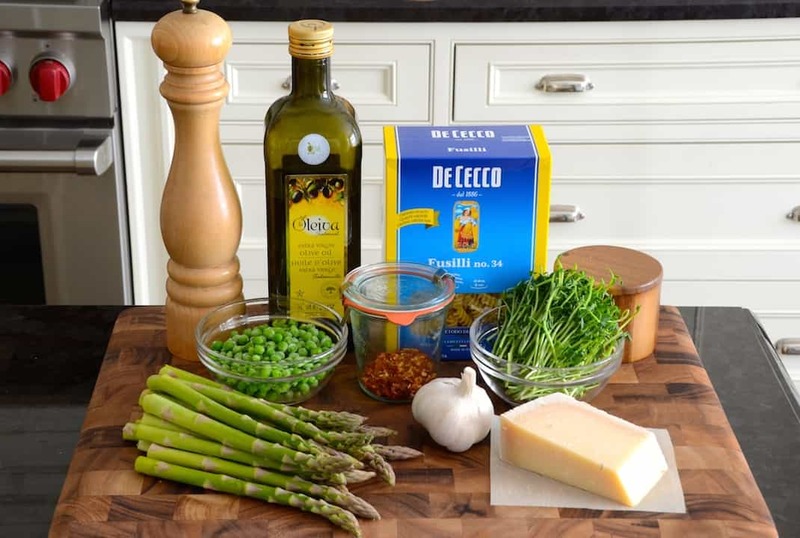 SERVICE – Our PASTA PRIMAVERA WITH PEAS AND ASPARAGUS is good to go right after you add the garlic and give the ingredients one final toss in the skillet. Transfer to rimmed soup plates and garnish with cheese and freshly ground black pepper. Although this recipe was crafted to serve two, you may have a tiny bit left in the skillet. We won’t refer to this as “leftovers”, because, quite frankly, they won’t be; you’ll finish the pasta in one go, guaranteed! 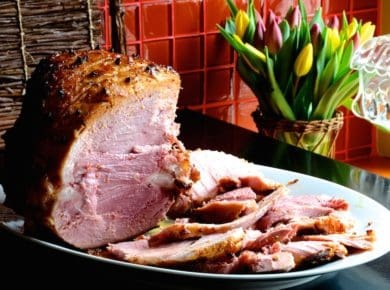 Looking for something else that might pair well with this dish? Let’s keep things fresh and uncomplicated with our HEALTHY CHOPPED SALAD WITH KALE fitting the bill as either a starter or palate cleanser. Lightbulb – yes, this entire meal is a vegetarian dream come true! 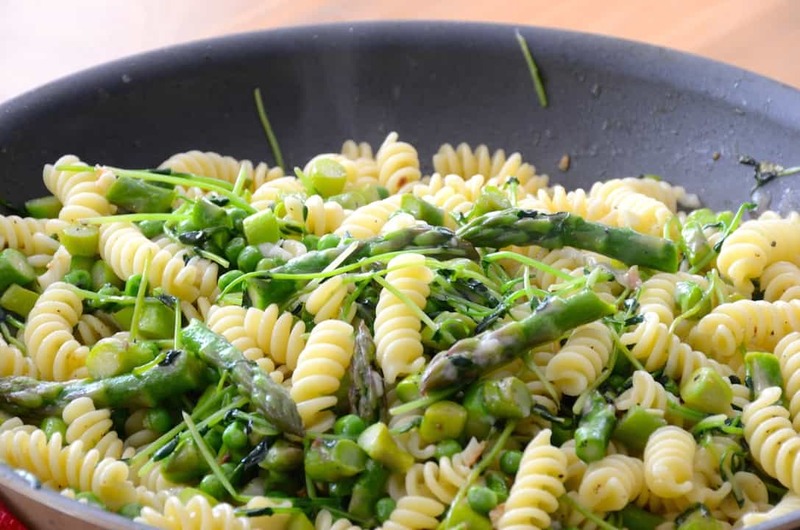 PASTA PRIMAVERA WITH PEAS AND ASPARAGUS offers the flavours of spring in a bowl. Let’s dig in! Would doubling this recipie serve 5 adults. You bet Joan… and even a portion of leftovers for the next day lunch!